Bowling Green has enjoyed the recognition it has received from being nationally ranked this season. But the Falcons haven’t handled the attention well, coach Chris Bergeron said. They’re only 8-7-3 overall and 7-7-2 in the Western Collegiate Hockey Association since Jan. 1. The Falcons complete the regular season Friday and Saturday when they host Alabama-Huntsville. Although BG is 19-10-5 and 15-8-3 for third place in the WCHA, it hasn’t played well on a consistent basis during the second half. The Falcons have played well enough to win most of their second-half games, but have played just poorly enough at times to lose. “We’ve been playing teams the whole second half looking at us with us having the target on our back, and that’s something we obviously haven’t done well with,” Bergeron said. BG has lost four of its last five games. The Falcons were 11-3-2 overall and 8-1-1 in the league going into Christmas. 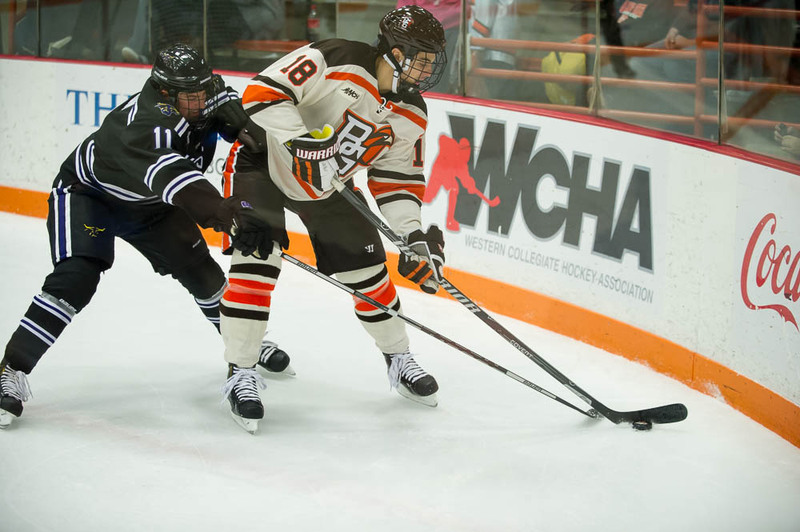 Sixteen of BG’s 18 league games during the second half are against teams below them in the WCHA standings. The Falcons expect another tough test this weekend from UAH, which is battling for a spot in the WCHA playoffs. The Falcons debuted in the U.S. College Hockey Online Top 20 on Nov. 10 and the USA Today/USA Hockey Magazine Top 15 on Nov. 24. BG was ranked as high as sixth in both polls, and is 13th in both this week. PLAYOFFS: BG is treating this weekend’s games against UAH as a playoff series. “This is a playoff series for us, so we don’t have to turn on any kind of switch starting next Monday,” Bergeron said. “We want to get into a playoff mind-set right now. The Falcons will host a best-of-3 quarterfinal series March 13-14-15 against Bemidji State, Northern Michigan or Ferris State. “We’re trying to get our guys to understand that this season is coming to an end, and we are getting to the point where tomorrow’s game is not guaranteed,” Bergeron said. SPECIAL TEAMS: The BG penalty-killing fell to second nationally at 90.1 percent after killing off just 7 of 10 attempts at Alaska-Anchorage last weekend. Cornell assumed the top spot at 91.1 percent. The BG power play is fifth in the WCHA at 14.7 percent. In the WCHA, UAH ranks seventh in power plays (13.7 percent) and eighth in penalty-killing (82 percent). UAH: The Chargers and Lake Superior are tied for the final two playoff spots with 15 points, three points ahead of Alaska-Anchorage. “(UAH) is looking at us as someone potentially in the way of them guaranteeing a playoff spot,” Bergeron said. “They play hard anyway. You add that to the mix, they’ll play even harder. The UAH program had been targeted for extinction for budget reasons several years ago, but received a reprieve when it was approved for WCHA membership. The Chargers are 8-22-4 and 7-18-1 this season after going 2-35-1, 2-25-1 last season, their first in the WCHA. SERIES: The Falcons are 11-3-1 all-time against UAH, including a 5-0, 4-1 sweep in Huntsville Oct. 17-18. BG holds a 5-1-1 edge in the Ice Arena, but UAH earned a split in BG last season.